After a fairly disappointing summer and a very short autumn, winter has arrived and looks set to be a cold one again. I generally don't mind the cold winter months as it means that I can start cooking traditional one pot dishes that are guaranteed to put a smile on your face and a little warmth in the tummy. 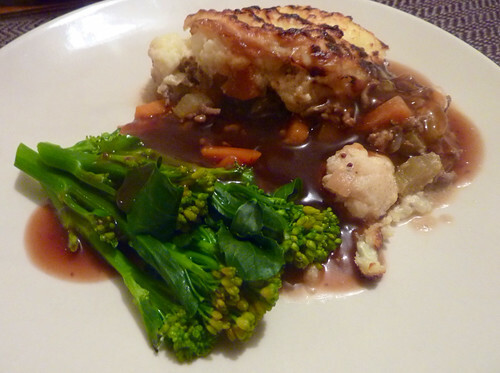 With one of these dishes in mind, on Monday evening I prepared my own twist on the classic Cottage Pie. The term 'cottage pie' has been around since the late 18th century when the potato was introduced as an edible crop for the poor, with cottage meaning the modest dwelling of a rural worker. The dish was prepared by lining a pie dish with mashed potato, a filling of leftover roast meat was added before being topped with more mashed potato and then baked. This is of course not to be confused with shepherds pie which is made using mutton or lambs mince. 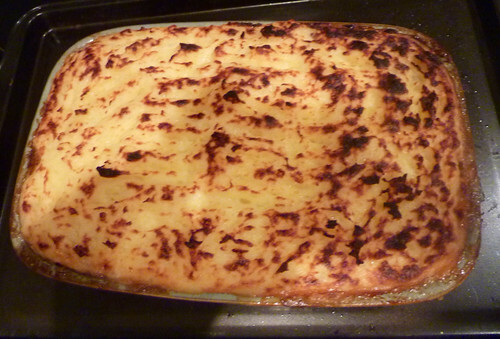 Not much has changes over the years, cottage pie is still as popular now as it was then. My own recipe has a little twist that I think works very well. Cut the potatoes into small chunks and boil in pan of salted water. When the potato is cooked through, drain before putting back in the pan with a little milk and a couple of knobs of butter, then carefully mash until you have a smooth consistency. Remove from the heat and stir the egg yolk through the potato. Set aside whilst you prepare the rest of the pie. Heat a little olive oil in a pan, add the onion, carrot and celery and cook until softened. Add the mince to the vegetables and keep stirring. Once the mince has browned all over, add a splash of Worcestershire sauce and balsamic vinegar. Keep stirring, making sure that the liquid has fully evaporated. Crumble the oxo cube into the mince and stir through. You may want to add a little splash of water to the pan but be careful not to add too much. The mixture should be glossy but not saturated. Remove from the heat and set aside. Add the cauliflower to salted boiling water and cook for 5-6 minutes. The florets should be al dente. Drain the water from the pan before stirring the soured cream, mustard and grated cheese through the cauliflower. To assemble, layer the mince into the bottom of an ovenproof dish. Top with the cauliflower mixture before spreading the mashed potatoes over the top. If you are planning on serving when you make it, place under a hot grill for 5-10 minutes until the potato is golden and crispy. I made mine the night before I was planning on serving it so needed a longer cooking time. If you are doing the same, cover the dish with tinfoil and place into a preheated oven 170C. Cook for 25 minutes then remove the foil, cook for a further 20 minutes until the top is crispy and the pie cooked through. To serve, spoon a generous amount of the piping hot cottage pie onto a plate alongside your favourite veg, with a little gravy on the side. The secret layer of cauliflower cheese work well with the creamy mash, adding another texture dimension to this classic and comforting dish.